In the six months since I joined The Writer’s Center staff, I’ve marveled at this organization’s heart. I was overwhelmed by it when I met so many excited and engaged people at my welcoming reception in July. I’ve continued to be struck by the amount of passion our community feels for The Writer’s Center throughout the year—at our events, in our workshops, and through correspondence and discussions with many wonderful writers and members. It’s a gift to be given this kind of job in a beloved organization. And I know that it comes with the responsibility of keeping it such a big part of everyone’s lives. Already this year we’ve debuted The Carousel, the redesigned version of our merged Writer’s Carousel and Guide to Events and Programs. Thank you to everyone who contacted us with your thoughts when you received it. We look forward to developing The Carousel into a significant part of our organization, and it will continue to serve as our official communication magazine. This spring we’ll have about 11 new workshop leaders providing courses for you. We’re so excited about these new workshops and hope you’ll be persuaded to give one—or some—of them a try. But what I feel most about The Writer’s Center is that we can truly become an essential part of the regional community. We’ve been busy forging partnership with other arts organizations, other nonprofits, and even for-profit businesses in order to serve you better--like Gaffney's Restaurant right around the corner, who has graciously agreed to cater our birthday celebration on Saturday; or Hot Breads, who donated a cake to our Poet Lore birthday and here again on TWC's birthday. Particularly in tough economic times, the spirit of collaboration and cooperation made in these partnerships will keep us strong, keep us tough, and keep us moving toward success. The Writer’s Center is and will continue to be a place people want to be, where all are welcome to pursue writing, participate in a community, and have their lives enriched through literature. I came of age in 1960s and '70s America when community arts organizations were springing up everywhere. In the early '70s, I worked in Cambridge, Mass, where impromptu theater performances were staged in abandoned movie houses; in Carbondale, Ill., where painters and sculptors transformed old factories into studios; and later in San Francisco, where writers and artists turned old military facilities into hotbeds of creativity. So, when I moved to Washington, D.C. in the 1990s and discovered the Writer's Center, it was like meeting an old friend since it, too, was born in the 1970s with that same legacy of community activism. The creation of community arts organizations in those days was slightly radical politically. Like the civil rights movement in the 1950s followed by the anti-war protests of the 1960s and the women's movement of the 1970s, artists marginalized by mainstream culture were energetically exercising their constitutional "right to assembly". They came together in a kind of creative solidarity wherever they could, sometimes pressuring local governments to provide spaces and sometimes just squatting until landlords surrendered. The National Endowment for the Arts, founded only in 1965, was not quite comfortable yet with the idea of supporting non-major arts groups that worked with artists outside the boundaries of formal institutions. That finally seemed to change, or at least for a time, when it dawned on people that the community arts movement was the real incubator of artistic creativity in the U.S. I began my career as an arts journalist at the Houston Chronicle in the mid-1970s at a time when that sleepy Texas oil town was waking up to a national arts boom. Through the 1980s, I straddled the arts and journalism in Chicago and later in San Francisco. I served on a handful of award panels for the NEA, including the panel on community arts organizations. I had an NEH Journalism Fellowship to Yale. I wrote a couple of books about outsider artists, wrote a weekly art column for the Chicago Sun- Times, and was editor of Artweek in San Francisco. In between, I taught art history and raised babies. Perhaps it was the call to action behind so much 20th-century European performance art or a general disgust with a frantic U.S. art market and art consumerism, but eventually I stopped writing about the visual arts. What took its place for me was a new passion for community building as its own art form. I now work in international development in countries where freedom of expression is often not a basic right, where creative forces are suppressed and not celebrated, where support networks for the poems, paintings or films of ordinary citizens can be clandestine and fragile. In such places, where government policies must be forged to support such activities, community building takes on a whole new relevance. Yet, I have not forgotten what I owe the arts or that the arts have been the engine of community for me. I have not forgotten the people whose lives would be forever impoverished if they did not write that short story or compose that tune or paint that mural. This is why I have volunteered as a Board member at The Writer's Center for almost 10 years. In a region full of unwieldy and impersonal bureaucracy, the Center is a glorious example of how a humble little community organization has kept the flame of independent expression alive and well for a generation of writers. While my Board work is pay-back to the arts and to a society that allows freedom of expression, there's another motive too. Someone asked me recently what writing I was working on. It was a fair question to a Writer's Center Board member, but the only honest answer was policy documents and e-mails. That's another reason I'm a Board member. When I get around to writing that short story, I want an alive and thriving Writer's Center to be there--for me. Charlotte Moser is Chairman of the Board of the Writer's Center. Formerly an award-winning journalist, she is the author of Clyde Connell: The Art & Life of a Louisiana Woman published by University of Texas Press and has published widely in the national arts press. [Read a selection here. ]Until recently, she was Manager, Global Online Communities for the Development Gateway, an Internet portal for development launched by the World Bank. Currently, she is a consultant for the Global Public Media Project at the School of International Service, American University. She hopes to be working soon on a media development project based in Kigali, Rwanda. I’d always written, but it wasn’t until my corporate husband moved me to Atlanta against my will that my real career began. I liked Georgia even less than Sherman had and vented by sending my friends accounts of my life with three small kids in a city where the locals didn’t seem to speak English and every street was named Peach-something. The friends advised me to write for badges; the company transferred my family to Virginia before I could start an insurrection among the other wives; and I found an ad for workshops at some place called The Writer’s Center. In addition to the joy of spending Saturday mornings with adults who did not want to discuss Sesame Street, I relished the plain existence of a true center where writers at every level of expertise hung out as peers. I’m sure I didn’t say much during the first couple of sessions until I figured out how a workshop worked. I didn’t put my name on the two short stories I submitted, though I can’t tell you what combination of ignorance, an out to not claim them if they sucked, or a vague idea of using “Anonymous” as a nom de plume prompted this. I was just happy to be in the company of other writers helping each other learn how to write. That’s still one of the best pieces of writing advice I’ve ever gotten, and the encouragement from the class that had become like family pushed me to keep going in ways I never would’ve on my own. Ten years, a MFA, a bunch of short stories and a published novel later, I was coming off a contract at AU when one of my students there, Julee Newberger, suggested I teach at TWC where she worked. It was like coming home. I've been here ever since. It’s the best place to teach. A community centered on writing, a literary oasis in the midst of political Washington, no grades. From the staff, to the instructors, to the students both new and returning -- a gathering of people both like-minded in their love of the written word and wildly diverse in terms of their backgrounds, experiences and approaches to recording their stories. User-friendly. Practical. Sane. Unique. Our world and welcome to it. I’m just glad to be here. About Barbara Esstman: Barbara Esstman, MFA, is a National Endowment for the Arts, VCCA and Virginia Commission for the Arts fellow and a Redbook fiction award winner, among other distinctions. Her two novels, The Other Anna and Night Ride Home, were published by Harcourt Brace and HarperCollins and are in numerous foreign editions. Both books were adapted for television by Hallmark Productions. She co-edited an anthology, A More Perfect Union, published by St. Martin's Press, and has taught extensively in universities. Her next workshop at The Writer's Center: Advanced Novel and Memoir. On the first Friday of every month galleries and shops in the Town of Leesburg, Virginia, remain open into the evening, showcasing the town’s historic and artistic heritage. Visitors and locals stroll the quaint brick walkways and wander in and out of art studios, specialty stores, and restaurants, often to the lively music of a fife and drum corps. Meanwhile in the lower level of the Leesburg Town Hall, writers and those who love the written word gather to enjoy programs focused on craft. Northern Virginia Writers is a special committee of the Writer’s Center. Formed in 1998 with the help of a grant from the Lila Wallace-Reader’s Digest Fund to “expand participation in arts and culture,” we offer these literary First Fridays in partnership with the Town of Leesburg. Everyone is welcome. NVW audiences range from beginning writers to seasoned professionals. Our long list of distinguished past speakers includes Ursula Le Guin, Henry Taylor, Tony Horwitz, and Geraldine Brooks. We’ve heard Pulitzer Prize-winner Edward P. Jones talk about the “power of place” and best-selling author Diane Chamberlain explain how to create characters so real we’d be tempted to claim them as dependents on our tax returns. Last fall we held a “Leesburg Idol” contest, our own writer’s version of the popular TV show. A team of literary agents led by head judge Jeff Kleinman (Folio Literary Management), one of NVW’s founding members, presided over the event. The winner received a free eight-week Writer’s Center workshop. NVW programs start at 7:30 pm, so there is time to walk around historic Leesburg and enjoy dinner beforehand. Our 2009 season begins with our February 6th “Icebreaker.” Warm up with a cup of cocoa, unleash your creativity, and meet other area writers. Programs continue on the first Friday of each month with the exception of July, August, and December. This year we’ll talk about ways to hook your readers, explore strategies to help you write every day, and look at creative tools such as word collages to keep your writing fresh. We’ll discuss the often circuitous route to publication and share tips on writing the personal essay. Visit our page on the Writer’s Center Web site for more information: https://www.writer.org> click on the “About” tab> Northern VA Writers. We hope to see you out in Leesburg in 2009! About Ellen Braaf:Ellen R. Braaf: MS, freelancer, ghostwriter, reviewer, teacher, has published fiction, nonfiction, and humor for children and adults. Author of six science books for PowerKids Press, Ellen has been a columnist and feature writer for ASK magazine (Arts and Sciences for Kids) since it was launched by the Cricket Group and Smithsonian magazine in 2002. She serves as Mid-Atlantic Regional Advisor for the Society of Children's Book Writers and Illustrators and as Co-chair of Northern Virginia Writers. Ellen is a Writer’s Center instructor and serves on the Board of Directors. Another distant snapshot: Calling Lisa Rhoades to let her know that she had won Poet Lore’s Ratner-Ferber competition, which came with publication and a $1,000 prize. I could have just mailed to inform her, but the thought of making that call was irresistible. Her happiness was so contagious I felt as if I had won the prize. Clearly I had missed my calling: I should have been a game show host. The first three executive editors I worked with were Phil Jason, Barbara Lefcowitz, and Roland Flint. They, and the editors that followed, all worked tirelessly to make a very good literary journal. I don’t think I’ve ever known anyone who gave so much, so selflessly, to the literary community as Phil Jason. It was an honor to work with him for several years. I’d be remiss if I didn’t give a shout out to two great recent managing editors, Jason DeYoung and Caitlin Hill. The first two creative writing workshops I took were with Ann Darr, a great poet and teacher who became a dear friend. After that I joined what might be called the Rod Jellema Gang, taking dozens of workshops with him over the years. After the workshop ended at 10 pm a bunch of us would go out for drinks at a little bar in Bethesda called the Rolling Inn. We were younger then. Later I took other several good workshops with Bill O’Sullivan and Bill Loiseaux. I was also fortunate to take a personal essay workshop years ago with Phillip Lopate, who we’re glad to have as our reader for this Saturday’s birthday celebration. Other memories: Trips to Colonel Brooke’s Tavern with Rod Jellema and Marty Galvin to hear the Federal Jazz Commission. Too many great readings to recount. I think of the 40th Anniversary Dryad Press celebration and the Jimi Hendrix anthology reading. We filled the room to overflowing to give thanks to Merrill Leffler and Rick Peabody, editors who have so generously contributed to the community. As I’ve said many times, the workshop leaders are the heart and soul of the Center, and I’ve been honored, and humbled, to be able to work with them over the years. There are too many names left out, too many people to thank. (Hi Rose, Hi Reuben. . . .) Years ago, when Al Lefcowitz and Jane Fox invited me to join the team here, I had no idea that decades later I’d be writing in this blog. My thanks go to Al, Jane, and all the founders. Looking to the future, a big thank you goes to the Board of Directors for a great decision, selecting Charlie Jensen as our Director. What famous beat author gave a Writer’s Center reading at Bethesda-Chevy Chase High School? The event was so popular, in fact, that we had to hold it in a big auditorium. Send your responses to postmaster@writer.org. Responses must be in by NOON on Tuesday. Winners will receive ONE $25 coupon off one multi-session SPRING workshop AND one year FREE membership to The Writer's Center. So we come to the close of a long week (sort of). Tomorrow I'll be participating in Anne Cassidy's "Polishing Your Personal Essay" workshop, which should be fun. Then on Sunday I'll be at the reading with James Mathews and Alex MacLennan--a reading that kicks off The Writer's Center's 32nd Birthday Celebration Week. What Native Washingtonian and Pulitzer Prize-winning novelist was a Writer's Center workshop leader? Choose one. Send your answers to postmaster@writer.org by NOON on Monday. The drawing will be held at 12:01. A friend of mine sent me this link on self-publishing today, and I couldn't help but share it here. Seems at least one lucky author has gone from self publishing her book to bestsellerdom. What will the future hold for publishing in 5 years? This article first appeared in the fall issue of The Carousel. Alex MacLennan will read at the Writer's Center this Sunday at 2pm. My story, though it embarrasses me to claim it in this way, is a story of success. In the years since I stepped into my first course at The Writer’s Center, I completed an M.F.A. in Fiction at American University, took second place in a local writing contest, sold my first novel a week before receiving my M.F.A., and watched that novel, named The Zookeeper, accrue nominations for a number of awards. Easy, right? A veritable piece of cake? The reality, of course, is far different. The road to that first novel, and the road since, has been far scarier than I’d ever imagined they would be. In February 2001, after a few months furtively scribbling my way through creative writing ‘how-to” books, I took an introductory fiction course at The Writer’s Center. Walking through those doors felt like crossing a dangerous threshold. I hadn’t written seriously since high school and college. I still read voraciously, but finishing a satisfying novel left me melancholy more often than inspired. I knew I wanted to write something. I knew I had the ability to string words together on the page. But I was worried—terrified, really —that I’d have nothing to say. See, I come to writing from a love of language, and a true fear of storytelling. I had no trove of plots and characters, settings, and resolutions on which to draw. Entering the space of The Writer’s Center terrified me. I felt as if I might be exposed as a fraud. Instead, the exercises I did in that class helped me find my story. Stories, actually. One novel down, another well underway, a hundred tales started and discarded and—many—taken up again. Now, I have a treasure chest of ideas to fall back on when inspiration refuses to strike. Now, I know that if I sit long enough, and stare down the blank screen often enough, a story will come. Now, I recognize that when the brooding storm of anxiety behind my eyes becomes overpowering, it often means a story is about to breach. And that knowledge, equal to any publication, is how I’ve come to define success. Thankfully, it’s not based entirely on accolades or book sales. See, about ten years ago at a Hollywood party on a hill, I spent a long ten minutes half-flirting with a handsome boy as he described in detail the financial implications of the commercial he’d just “booked.” Apparently, a single national commercial earned him over $30,000—nearly my annual salary at the time. I was jealous, awestruck, and full of congratulations. He stopped me, however, to clarify. The commercial, he explained, was just a stepping-stone. He wouldn’t be happy until he “was” Brad Pitt. I was dumbstruck. If “Brad Pitt” was the only measure of success for an actor, how should an aspiring writer define the word? Are Joan Didion and Michael Cunningham the only appropriate literary measures of success? What about Philip Roth? Amy Tan? Must I sell as many copies as Ann Patchett’s Bel Canto to consider myself a success? I needed another measure, and set about creating one. What if, rather than assuming success required blockbuster sales numbers, I relished each small victory as it came? Thrilling to a paragraph that rang with beauty or truth. Relishing the act of finishing a story and seeing it published. Writing one essay. Completing a single novel and finding it a small, niche publishing house to call home. My mantra, however trite, was that I didn’t need to be Brad Pitt to call myself a success. And that’s been a very good thing. Finally, just two months ago, a gay American teenager from a red-state American small town wrote to say he’d found The Zookeeper and that he had “always wanted to read about someone like” the novel’s main character, Sam. So yes, I guess I can call myself a success, no matter how many copies the novel actually sold, and no matter how terrified I may be that this new novel isn’t strong enough to find its way. I’m not in any way where I dreamt I’d be all those years ago, but it feels absolutely wonderful to be where I am. Of course, some things stay the same. Every time I walk out onto the precipice of a new story, I’m still terrified that I’ll have nothing to say. Is finally here. No post today other than this. There's a lot happening here these days. 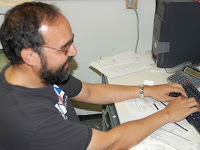 Abdul and I are busily trying to finish up the next Carousel (with thanks to Sunil for providng the workshops and events). We're on schedule right now, so we hope to have something in members' hands in early February. I wanted to share this interesting piece on how "novels help drive social evolution" from The New Scientist. Oddly, I'd viewed it at the beginning of the week (a friend had sent it to me) and then later in the week another friend sent it to me. So perhaps you've already seen it. Member Nandini Lal recently contributed to the Peace Mural here in D.C. Here you can see her standing next to the poet Huong and her poem, which is at the extreme right, third from top. Also, she informed me that her "Erasure Poem" (where random bits are deleted from source texts to create poetry) is up on the Wave site yesterday. "One of my kids has a Kindle that I played around with. It was so easy to use that even a tech idiot like me can navigate around. Small, compact, and great for travel -- no more hauling tons of books or running out of stuff to read on long flights. Self-lit so you can read in the dark. Lays flat, so no more propping open the book you're reading with other books while eating your cereal. Capability to insert notes, if you like to scribble in your books. Avoids the problem of crammed bookshelves and mags that need recycling. Fun to roam around in, since you can get samples of available books to check out. For example, "Twilight" is really boring, unless you're a 14 year old girl who's not an adept reader. But I found chapters with critical commentary from a collection of Oe's novels that was brilliant. On the other hand, a bunch major lit authors like Garcia-Marquez are MIA -- esp. non-Americans; slim selection of translations (Garnett only for the Russians); and a bewildering array of others, like 44 editions of "Jane Eyre" with no way to tell the advantages of one over the other. But a pretty nifty device anyhow. I hardly ever say that about any machine." Thanks for sharing that, Barbara. Hope to see you on Sunday for the Poem, Revised event here at the Center. We'll be closed on Monday and Tuesday, but back again Wednesday. This blog will feature an interview with member and Katherine Anne Porter Prize Winner James Mathews (Last Known Position) on Monday. He'll be reading, of course, with Alex MacLennan on Jan. 25 here at the Center. Until Monday! Caroline or Change is a dazzling musical written by Tony Kushner in its final weeks at Baltimore’s Centerstage. Set in Louisiana in1963, amid the recent assassination of President Kennedy, the bourgeoning Civil Rights Movement, and the widespread “change” in ideas about what direction the nation ought to go in. The story revolves around Caroline, a black woman working as a maid for a Jewish Family. She works in the basement where the heat is overwhelming. Caroline raises important questions about class, the possibility of mobility, and the racial tension between Jewish and Black Americans. Most of the scenes show Caroline working in the literal and figurative “basement,” the ground floor of the house and society. There were portions of Caroline’s character that echoes Ruth from the classic Lorraine Hansberry play of the 1950s A Raisin in the Sun. In a big way, the music made the show. Only a special mind could have imagined such a spectacle. Many of the songs were poignant and memorable. And the set design was stunning. Yet still, the subject matter was undermined by all of the shiny dresses and flashing lights. Any student of theater will tell you that conflict is the stuff of great theater. Is there a way for a musical to serve the text while being entertaining? Does the world of theater have to be divided between serious straight plays and the musical? I e-subscribe to Narrative Magazine. Today in my inbox I got an e-mail from them stating that they're now available on Kindle. This is interesting news. Those of you who've read this blog from the beginning know that I blogged on the subject of Kindle on June 27th. From the e-mail: "Kindle, with its free, global, wireless means of downloading material directly to the handheld device, offers Narrative for an inexpensive monthly subscription of $3.49." This is an interesting experiment. Quite possibly Narrative is on the vanguard of something. If it isn't on the vanguard of something big, then what harm can it cause? Will other lit journals follow? But she's much more than a "fashion" writer (as if that's a bad thing anyway). Her article in yesterday's post was characteristically brilliant. What I enjoy so much about her pieces is how she melds social commentary and contemporary fashion (often fashion takes a backseat). Anyone interested in learning how to write about today's culture must read Robin Givhan. Enough said. As a prize, she will receive one free workshop of her choice. E. Laura Golberg as part of Takoma Park's Third Thursday Poetry Series. The reading will take place in Gallery 3 on the third floor of the Community Center. I was at a reading the other night at Cafe Muse featuring Kathi Wolfe and Brian Brodeur. There was an open mic following the reading and both Judy Neri and E. Laura Goldberg read. They were terrific as well. So, if you're able, check out these three fine poets. Have a great weekend everybody. Perhaps I'll see you at our Writer's Center staff reading this Sunday? Something happened to me the between Christmas and New Years. 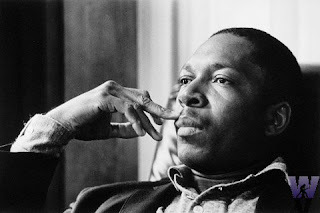 I felt a lot like John Coltrane must have felt in the photo above. Like many “good” writers I planned to get some work done making my spiked egg nog all the merrier. The truth is I couldn’t muster one word in my journal. And, I didn’t feel not one iota guilty. I think I may have sighed once at my green notebook staring at me from across the room. I’ve never been a New Year’s resolutions type. They tend to fade as quick as you make them which begs the question are they really resolutions? Surely, if something is important enough to resolve to do, why wait until New Years? One thing, I’ve decided to do is stop writing so much. Yes, I know this sounds counterintuitive but hear me out. There’s a very seductive lifestyle that writers build around themselves. After a while, all of the readings, book signings, book club meetings, and open mics start to substitute for actual writing and more important reading. There’s about a thousand reading series in the D.C area. With all of the many contests, deadlines and whatnot, after a while you start down this path of writing for the industry of writing and not so much for why you started writing in the first place. I don’t know about you but writing for me happened first as a reader. I absolutely could not imagine not having something to read on my way to school or between classes or even just a companion to brave the quiet with. Then, one day I realized that I was consumed with the things I read, the ideas, the new ways of viewing the self and the world that this new self inhabited. Writing was about learning about myself and the world. It was about trying to create a beautiful creature that others could play with inside their minds. It was about secret ecstasies that only other readers and writers knew about. Yes, it was about participating into a world that seemed exclusive. That place seems so far away these days. Writing should happen because it must exist. The novelist Toni Morrison talks about how the story she wanted to read didn’t exist so she wrote it. I like this thinking. In a world of billions, it takes a single person to give validity to a reality that billions know about. Don’t get me wrong. Recognition is really nice. But, I feel like I need to do much more reading. Make sure that my work is growing. Am I taking risks? It’s kind of like the actor who plays himself in every film. I don’t want to be that writer that simply talks about the same subject in every poem, every essay, every story. Until then, I’m slowing my pen. And how are those resolutions coming along? Lost any weight yet? Battling the throngs at the gym for a sweaty turn at a machine? But you are writing, right? So what is your writing goal for 2009 – and please don’t say “Write More.” You wanna know why? ‘Cause you will never, ever write enough. Nope. Never. So you are doomed (DOOOoooom-ED) to failure. So let’s set up for a successful 2009, shall we? Let’s get a couple things straight first. First of all, last week had exactly 7 days and each one had 24 hours in it. Same with the week before, and the one before that. You used every single minute, eating, sleeping, working, watching TV, whatever. If you are going to “write more” this week, then something from last week has gotta go. Law and Order reruns? Lunch out of your office? Sleep? I don’t know what it is, but something has to get cut to make room for you to write. Now, instead of “Write More,” make a concrete goal that you can achieve. Don’t say “Get Published” because that’s not in your power. Say, “Mail out 10 things a month.” Go to www.duotrope .com once a week – pick a day of the week to work on subs, but make it concrete and in your control. Sound like a plan? Need more support in your resolutions? Sign up for a workshop! And I notice a lot of folks posting a “Best of 2008” reading list. That’s a great exercise. You should try it! Make a list of your 5 -10 favorite books of ALL TIME. Take your time. I’ll wait. Humming. Drumming fingers impatiently. Whistling tunelessly. Final Jeopardy music playing in background. Okay then. Got your list? Eggggcelent. Oh, yes, I know that was hard. Now, look at it carefully. Any similarities? Oh, lookie! You like books in second person! Good to know. Are these books character or plot driven? Are there similar devices, similar main characters, similar type plots? Lots of twists? Written as a journal? Are some of the same genre? Does setting play a major role? This is INVALUABLE information to you as a writer – this is what is important to you as you write. Your first goal in writing ought to be to write a book you would want to read. Now you know what is important to you, study it. Make a science of it. Know it. And it will have a lasting effect on your writing. Promise! And good luck with your writing in 2009! Keep at it. It will be worth it! *See, that’s the name of the blog. That’s irony. And the end of the entry. See how I did that? Clever, eh? Okay, it’s late and clearly the coffee has worn off. Get writing! The next course she will teach for The Writer's Center is The Process of Fiction, which will be held in Arlington at the Cultural Affairs Division Building. I'm not going to talk writing today. Today's a day for listening to music. Last month, Tom McBride and the Whig Party played under a canopy of white Christmas lights and a wreath on the stage at Iota. This club-and-cafe is an intimate venue, and except for anyone standing behind the large partition in the middle of the room, the view is up close and personal, and it was a pretty good crowd for a Tuesday. Around 10:30 pm, a collection of five musicians took the stage, all dressed in variations on a business casual theme, as if they had all left the office to meet up for an after-work jam session. The band’s founder is front man Tom McBride, originally from Boston, who assembled the Whig Party from exceptional musicians hailing from Rockville, Maryland, who are all connected through some channel stemming from their high school or college days. The band has a distinctly southern vibe, no doubt owed in part to the time McBride spent as a student at Tennessee’s Vanderbilt University. The music picks up influences starting somewhere in the bluegrass tradition of the Smokey Mountains, traveling down through the hills to Nashville with its sliding melodies, galloping country-western cadences and the slow rhythm of the blues, and dipping as far south as the Louisiana Bayou with some light Zydeco. The Whig Party has the same kind of dichotomously serious and playful dynamic as the Charlottesville-based Dave Matthews Band. Drummer Andrew Toussaint and Jason Mattis, on bass, laid the foundation and commanded the rhythm of the room, moving handily from swing time, to Zydeco, to the deliberate down-beats of their blues numbers. On top of that foundation was the interplay between three very talented musicians. McBride showed his chops on the guitar with assurance, barely glancing down to see what he was doing. Chad Fisk had a similar command of the keyboard, and Colin Crawford on the alto sax conjured the same kind of soul as that of the late LeRoi Moore of Dave Matthews. There were significant and pleasurable stretches of pure instrumentals, allowing the three to show off their individual and collaborative abilities. During certain moments, his vocal tone suggests hints of Eddie Vedder, Chris Cornell, James Blunt, and even Kurt Cobain. His deep voice ascends and descends masterfully. McBride is also a gifted poet. Read his stuff here. Not afraid to test the vocabularies of his listeners, he tells musical tales that exercise the imagination, and tempt the brain to intellectualize and interpret, though the power of the music allows the mind to save the over-thinking for the silence that inevitably follows a night of good music. The pieces offer so much more than the regular heartbreak and lust to which so many singers often turn, though when he does visit these themes, his take on them is more articulate than that of many of his contemporaries. As the show progressed, the band stayed definitively cool. Fisk wore shades throughout the evening as he tickled the ivories of two keyboards, and McBride barely broke a sweat as he traversed the fingerboard of his guitar. Plenty of smiles were exchanged by the band-mates and the fun they were having on stage permeated the audience, keeping the night-owls entertained until past midnight on a weeknight. In the spirit of Christmas, half of all proceeds from the evening went to Bread for the City, a food bank that serves the less-fortunate of the DC metro area. Anyone who wants to hear a local DC band with copious talent and minimal pretense needs to check these guys out while they are still playing small local clubs without exorbitant ticket prices, because this band is going places. Their album drops in February. In 1926, Walter Lord, nine years old, persuaded his mother to cross the Atlantic aboard the Olympic. The choice was no accident; the Olympic was sister ship to the Titanic and already the doomed White Star liner sailed in and out of young Lord’s imagination. The following year, he wrote and illustrated an account of how the Titanic sank in the early morning hours of April 14, 1912 with the loss of more than 1,500 lives. Classmates at the Gilman School in Baltimore and later at Princeton and at Yale Law School, as well as colleagues in the Office of Strategic Services during the war, and even associates in his post-war jobs in journalism and advertising remember Lord’s fascination with the disaster. In retrospect it seems inevitable that the Titanic would be the subject of his first foray into book-writing. In July 1954, while a copywriter at J. Walter Thompson, he proposed the book to his friend Howard Cady who was an editor at Henry Holt Publishers. “The whole book will be limited to the eight hours between the time when Lookout Fleet sighted the iceberg and the time when the last survivor climbed onto the deck of the rescue ship. Everything else can be woven in. Minute by minute, the reader will live with the ship’s company during her last breathtaking hours and when he finishes, the reader will go on his way, knowing well that in the words of the title—here was A Night to Remember.” Amazingly, not one book had been written about the Titanic since 1914. A Night to Remember was an immediate bestseller, bringing him another contract, this time for Day of Infamy, a book about Japan’s surprise attack on Pearl Harbor on December 7, 1941. One of Lord’s important contributions to this subject was his exploration of the Japanese perspective. He also sent out a detailed questionnaire about the attack to which he received more than 1,000 responses. The use of questionnaires became key in the Lord modus operandi. When Day of Infamy topped the bestseller list, Lord realized he could make a living as a writer. He had taken a totally new subject—one about which he knew relatively little—and with exhaustive research, turned it into a vivid story that told people a lot more than they might have expected. Neither was it the Lord approach merely to tell all about the battle but to show from several points of view how human nature behaved in crisis. Lord honed this eye-witness approach to history to perfection whether writing about the defense of the Alamo in A Time to Stand (1961), or the skirmishes over the admission to Old Miss of James Meredith in The Past That Would Not Die (1965), the Battle of Midway in Incredible Victory (1967), the Coastwatchers of the Solomon Islands in Lonely Vigil (1976), or the evacuation of allied troops from French beaches in May 1940 in The Miracle at Dunkirk (1980). In 1972, Lord developed symptoms of Parkinson’s disease after publishing The Dawn’s Early Light, about the War of 1812. 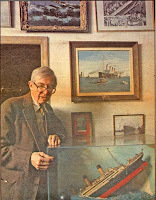 The illness slowed his output yet he went on to write three more books, including a second book about the Titanic, The Night Lives On (1986). Walter Lord wrote 12 books in all—short page-turners packed with compelling recall from every point of view—using techniques that made history come alive and that shaped the way popular history is written today. He died in 2002. A forthcoming memoir, The Way It Was: Walter Lord on His Life and Books, will be published in January, edited by Jenny Lawrence, a freelance editor and writer based in New York City.